Optical lenses that can see features smaller than the wavelength of light cannot be made from conventional materials. Creating "hyperlenses" that can take ultra-sharp images needs both designer materials (that is, metamaterials) and innovative optics to be developed. Current methods for fabricating such synthetic metamaterials are complicated and involve assembling artificial cells and patterning processes. Scientists wanted a simpler, cheaper way and Texas A&M invented it. Their new one-step method directs the self-assembly of metallic gold pillars into a special oxide using pulsed laser deposition. Super-sharp images and biological sensors require altering how materials react with light. Materials created by the new approach provide an exciting option. Scientists can now control and enhance the optical response by controlling material properties at nanometer scale. Such materials open unprecedented possibilities for developing light-interactive photonic devices for cloaking and super-resolution imaging. 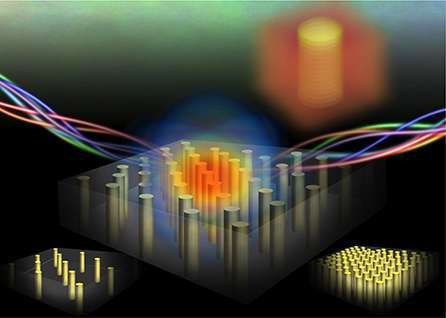 Scientists demonstrated a self-assembly approach to fabricating nanoscale metamaterials that are built on vertically aligned conducting metallic gold nanopillars embedded in oxide such as barium titanium oxide matrices using a one-step deposition method. Such nanocomposites permit the control of the density, size, and alignment of metallic gold nanopillars. In other words, the key feature of such nanocomposite thin films is their anisotropic and largely tunable optical properties due to the controllable microstructures of the composite. Optical spectroscopy measurements supported by theoretical simulations reveal the strong broad absorption features of the films. The team's results illustrate that there are many advantages of vertically aligned metal-oxide nanocomposite in fabricating large-scale and novel nanoscale photonic materials such as metamaterials for super lenses, biological sensing, subwavelength imaging, cloaking devices, and more.